Make rabbit manure tea for your garden. A "cool" tea, loaded with nutrients. Rabbit manure tea is a great way to feed the exceptional nutrients in rabbit manure to your garden. It is even more powerful when you add to your tea valuable trace minerals. Quite a few years ago we kept some rabbits in a large wire cage under the overhang of our house. The cage had a wire mesh floor, so the rabbit's poop and urine just dropped to the dirt below. I wish I would have known then that rabbit manure is perhaps the best manure fertilizer. My lime tree would have loved it! Rabbit manure has a higher percentage of nitrogen than manure from cows, horses, sheep, goats, pigs or chickens. Yet, it is classified as a cold manure. This is because the nitrogen in rabbit dung is a slow release nitrogen, making it less likely to burn tender roots. Another advantage of rabbit manure tea is that it doesn’t have much of an odor, making it more pleasant to work with. Rabbit manure has fewer pathogen problems than manure from feedlot animals. For non-edible crops, some people use fresh rabbit manure to make their tea. If you are going to put your tea on your vegetable garden, then it is best to allow the rabbit manure to sit and rot for at least 6 months, or put it into your compost pile. 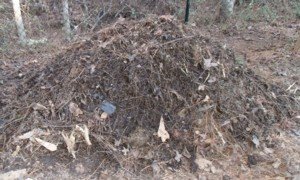 Of course, once your rabbit manure is mixed with carbon items and composted well in your compost pile, it is no longer just manure, it is compost, and you can use it to make compost tea. Compost piles need nitrogen to help them heat up to the desired 150 degrees F. Rabbit manure supplies this nitrogen. Mix it in with some good carbon sources, turn the pile occasionally, and within 2 or 3 months your compost will be broken down and safe for use on your garden. Unlike compost tea, to make manure tea we simply dissolve nutrients from the manure into water, making these nutrients instantly available to the plant. The easiest way to make it is to put about a gallon worth of rabbit manure into the bottom of a 5 gallon bucket, then add water, and stir occasionally till you have a weak looking tea. This can take a day or two. Just dip your tea out of the bucket, thin it down till it is a weak tea color, and apply about 1 to 2 pints to the soil around each plant, not on the plant itself. Manure teas are especially beneficial in helping plants in the growth stage. Don’t apply manure tea once the plant is ready to set fruit, since the nitrogen in your tea will encourage the plant to grow larger but set less fruit. Rabbit manure tea is a good source of nitrogen, phosphorus, potassium and calcium. However, rabbit manure is lacking in many of the trace minerals. To meet this important need, I always add an ounce of Concentrated Sea Minerals to each gallon of tea. 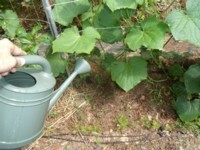 When you are done reading my manure tea pages, you might like to check out my home page, Healthy Vegetable Gardening, for a wealth of information on growing a highly nutritious garden.